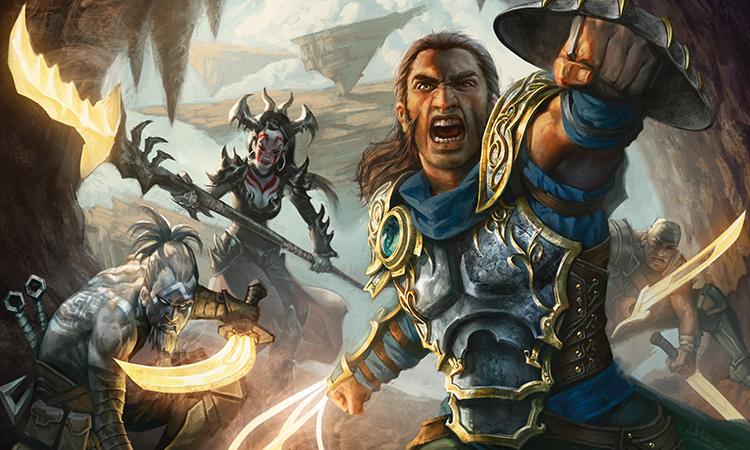 Noyan Dar was once a lullmage, one of a specialized tradition of wizards who learned, through painstaking practice, to calm the fury of Zendikar. The problem was the Roil, the unpredictable magical "weather" that could bring anything from squalls and windshears to uprooted earth and sudden vegetation. Explorers of the wilds who knew what they were doing always brought at least one lullmage on their expeditions, lest they find themselves at the mercy of the elements. But times have changed. 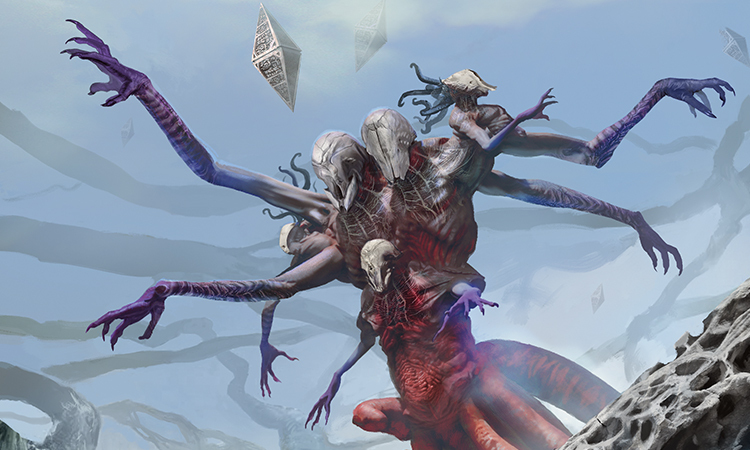 The Eldrazi have risen. 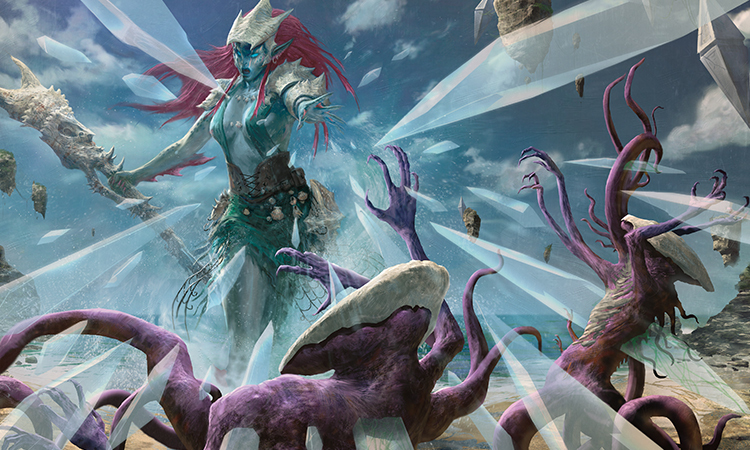 Gideon Jura is seeking allies to fight the Eldrazi at Sea Gate. And the Roil, once Zendikar's most deadly danger, might now become a crucial weapon in its salvation. "Balance is death!" The voices of the initiates rang clearly, though not beautifully, in the damp air. They had been taught to yell the litany, even shriek it, regardless of what the resulting sound did to Noyan Dar's ears. Dissonance was not to be ignored, but embraced. "Calm is death!" The chanter performed a strange dance as she led the group through the litany. Ripples of earth moved under her feet in a desultory fashion, but still with enough momentum to generate an occasional stumble. As she tripped, she emitted a high-pitched intonation on whatever word escaping her lips, regardless of meter, pace, or good sense. Hearing a whinnying, croaking cry of "deeaaath!" was not a pleasant way to spend the morning. Which was, sadly, entirely the point. The whole arrangement was unpleasant. 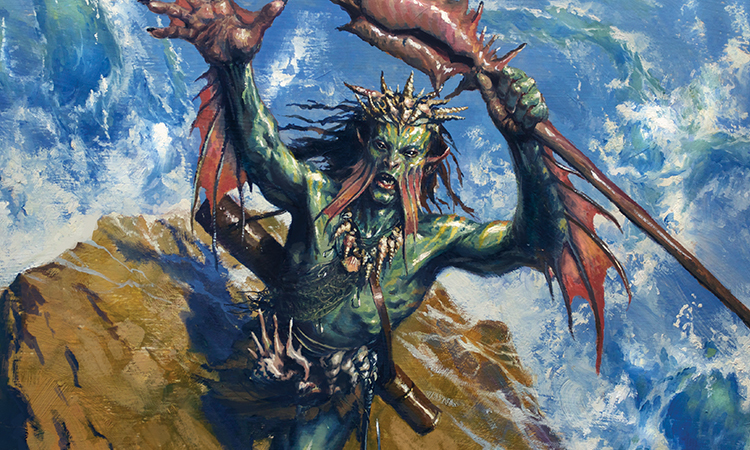 Noyan imagined what type of environment a typical brilliant merfolk scholar-mage—who loved the ocean and the suitable moment in which to indulge some witty repartee—would create for himself. It would clearly be the exact opposite of this retreat at Coralhelm, which was miles away from wit, surrounded by either lunatics or the incompetent and often both. The fact that he was the one responsible for creating the retreat only gave him the briefest ironic pleasure. Mostly it made him very irritated. Which was again, sadly, entirely the point. "Peace is death!" 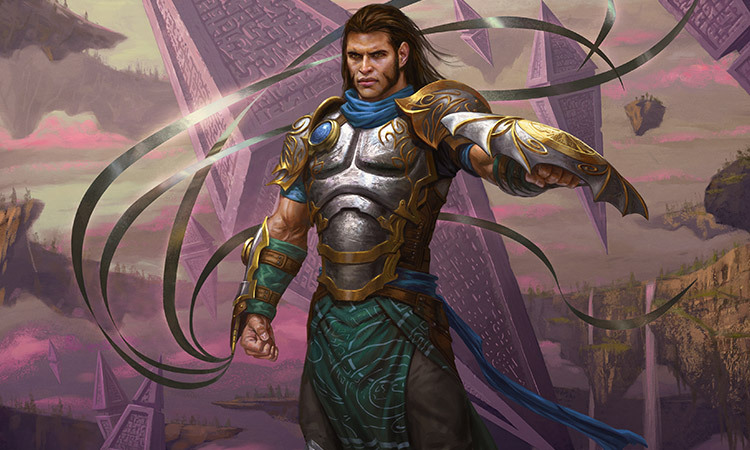 Noyan Dar resented many things about the awakening of the Eldrazi. He had lost his home, his quiet, and the ability to fight opponents he could visibly irritate. But what he resented most were the near infinite times he had heard this damned chant. That he had written the litany gave him no pleasure, not even ironically. It was a deliberately poor and arrhythmic chant, and apparently he was doomed to hear it repeated for the rest of his life. Or only until the Eldrazi came and ripped apart his innards or emulsified his brains or transmuted him into dust. It was important to have things to look forward to. At least Noyan no longer had to lead the initiates in their rituals. Other initiates distinguished by being slightly less incompetent than the rest had taken to the rituals as their personal salvation. Actually mastering how to use the Roil without killing yourself or those around you was very hard, but butchering rhyme and meter and Noyan Dar's ears was trivial. The chanter stumbled through the next sentence, treating everyone to a pained rendition of "The world heaves!" The other initiates dutifully strived to match her strained tone, many of them adding their own unique atonality to the mix, creating what Noyan thought was the literal definition of cacophony. It was all to the greater good, and like most sacrifices to the greater good, enjoyed by no one. The next words in the litany shook around in his head, "It shakes. It strives," but he realized there were no sounds coming from reality to match. He looked up to see the chanter and initiates all staring toward the sky behind him to the south. Noyan turned and saw a kor kitesailer carrying a passenger in a harness. They were only minutes away from landing, but they were coming in from the wrong direction. The retreat on Coralhelm was difficult to access. Protected by a large gorge on all sides, their floating landmass was roped to the edges of the cliffs. It was possible for a skilled Kor cliffwalker to shimmy down the ropes, but most people coming to the retreat flew there. But only from the north. Even without the Roil, the winds in the canyons were unpredictable and dangerous. With the Roil, and especially with tens of roilmages—most of them not particularly skilled—the winds could be very predictably dangerous. Especially coming from the south, which is why all of their comings and goings to their floating retreat came in from the other side. The fool kitesailer was going to become one with the earth very intimately and very mortally. Noyan ran forward, his arms flapping, his lungs rasping. The kitesailer could not hear him and was making his preparation to swoop in and land when a ferocious updraft took him and his passenger fifty feet up and sideways with such force the harness attachment sheared off and his passenger plummeted to the ground hundreds of feet below. Noyan could only watch in horror and then puzzlement as the man fell. Unlike Noyan Dar, the man was not flailing or yelling or for that matter looking perturbed at all. He fell with grace, if such a thing were possible, though he was clearly falling to his certain death. Noyan continued to run forward and began casting a spell to buffer the man's fall—though at his speed, the buffer would just leave the corpse in slightly nicer shape. There were several flashes of sparking golden light and the man's body glowed. Just before he hit the ground, Noyan saw some kind of shimmering wave erupt beneath him, and he hit with an impact that Noyan felt travel up through his own legs and pitch him forward tumbling to the earth. As Noyan lay there splayed to the ground, groaning while checking he hadn't broken anything, he tilted his head up, expecting to see some form of gruesome blood pancake. Instead he saw a tall, armored man, standing with the sun glinting off his armor behind him, with nary a scream, blood, broken bone, or even a bruise in sight. Noyan slowly got to his feet, still wondering how the man survived. Behind them the kor kitesailer had managed to land safely and was running towards the two of them, presumably to check on the health of his passenger. The man looked at him closely and said, "I'm Gideon Jura. I'm looking for the roilmage, Noyan Dar. You have some blood on your nose. Are you well?" The look of concern was so genuine Noyan wanted to scream. He did, just a little. It was the best he felt all morning. "It destroys or it dies!" The initiates had resumed their cheerful litany, and Gideon Jura raised an eyebrow. "I was told you were the head of an elite elementalist force." Gideon's head swiveled, glancing briefly at the twenty or so of Noyan's initiates shrieking into the air and waving their arms in random patterns in the courtyard. "Are they practicing in the building . . . ?" Gideon peered through the courtyard into the empty living quarters behind. "They're invisible. It's hard to remain an elite fighting force when just anyone can see them." Gideon stared at Noyan flatly. Noyan continued to feel better. "Find your inner peace! Kill it! Crush it!" Many of the initiates made chopping or jumping motions as they went through this part of the ritual. Some really enjoyed demonstrating just how thoroughly they were demolishing their inner peace. So much grass had suffered for the sake of conquering inner peace. Gideon raised an eyebrow. "Those are some . . . unusual rallying cries. Is there somewhere quieter we can go?" A small group of uncoordinated and tone-deaf initiates were able to do what falling from two hundred feet had not—make Gideon Jura uncomfortable. Noyan Dar raised a hand and brought it down hard. The earth rumbled for a second and then quieted. The initiates and chanter quieted as well. "Initiates, practice your forms. Please use . . . discretion." The initiates had learned through very painful error and error what discretion meant. As they walked towards the center of the clearing, Noyan noticed the balance of the man beside him. He walked in a perfectly measured stride, each step balanced and poised, able to turn into a crouch or leap or attack depending on his whim. Noyan had never seen someone so fully in control of their movement and their body. Gideon Jura would make an atrocious roilmage. "How did you survive the fall?" Noyan thought it quite a remarkable feat. If roilmages could learn that type of protection, there would be more live roilmages. Though that would mean the life expectancy of non-roilmages would suffer. "I am . . . resistant to harm." Gideon paused and looked at him, saying nothing. Noyan also said nothing, hoping the absence of words would encourage Gideon to fill the void. After several moments of silence, Noyan tried to help. "You seem . . . resistant to explanation." More staring from Gideon. He seemed adept at it. "I was told you and your troops could control the earth, the air, the water. We need your help at Sea Gate." Gideon then decided to again stop speaking. Gideon seemed far more comfortable using poignant pauses and searching looks to communicate than, say, actual words. Noyan thought perhaps this was a language worth learning. "First, we are in the middle of training and can't just gallivant off to Sea Gate. Second, we are not . . . elementalists." He paused to let his full scorn dwell on the word, and looked expectantly at Gideon's face. Apparently Gideon did not understand the language as well as he spoke it. After a few more seconds of silence, Noyan was disgruntled. It was boring to be deliberately silent. "Do people sneeze where you come from?" Far better to be insulting. Gideon gave him a blank stare. "You know, like ah-choo!" Noyan mimed a human sneeze, with a copious amount of snot at the end. Gideon's stare flattened. "Yes, I know what sneezing is," Gideon responded. At least there was no poignant pause or searching glance at the end. "My people have many stories and myths about the three gods. One of the favorites for children is 'Ula and the Ocean's Sneeze.' Cosi convinces Ula that there is a powerful magical pearl, hidden deep in the heart of the ocean. So Ula searches for the heart of the ocean, so he can steal the pearl. Eventually he finds the heart and reaches inside, but as he's pulling the pearl out, Ula's sleeve scrapes the inside of the heart, and the heart sneezes. Ula is trapped in a giant cocoon of solid white snot, until Cosi comes along to free him." Noyan smiled. "White snot." The flat stare on Gideon's face threatened to become a permanent fixture. "The point is not the white snot, as interesting as it is; the point is the sneeze." No enlightenment sought to wrestle with the flat stare. The flat stare remained the clear winner. Noyan sighed. What point to be cleverer than your enemy when they could not perceive it? He could not tell whether Gideon or the Eldrazi were worse in this regard. "The Roil," Noyan continued, "the Roil is the sneeze. The Eldrazi are an irritant to the world. The Roil built up over time as a natural defense against the presence of the Eldrazi. Prior to the Eldrazi's arrival, those of us who called ourselves lullmages spent years trying to perfect the craft of quieting the Roil. As if we were a healer soothing a fever." "But then the Eldrazi returned." Noyan was grateful for the presence of Gideon Jura, master of the obvious, to perpetuate the illusion of a conversation. "But then the Eldrazi returned. And the Roil returned in full bloom with them." "So being a roilmage should be easy, then." "Easy, except for two problems. First, intensifying the Roil is easy, but intensifying it without killing yourself or any near bystanders is very, very hard. Unless you're . . . resistant to harm." Gideon's eyes narrowed but Noyan continued. "Second, the mages most experienced in dealing with the Roil are . . ."
"All the lullmages who spent years learning to do the exact opposite," Gideon finished for him. Noyan smiled. A genuine intelligent response! The world was full of surprises. "Exactly. Combatting the instincts of pacifying the Roil instead of heightening it proved to be a mental switch requiring much training. In fact . . ." Noyan raised his arms in a dramatic fashion and there was a loud thunderclap in the air. The roilmage initiates ran over and formed a large circle around Noyan. "Llura, lead the litany please, from the beginning." Llura had a large smile on her face as she wailed and flailed. The initiates dutifully followed, every awkward word creating a hole in the fabric of good taste that could never be repaired. It destroys or it dies! Do not become one with anything! Feel your loneliness! Your fear! You are out of place! Every step you take creates dissonance and chaos! You will strive! You will shake! You will heave! You must destroy or die!" Despite every awful word, Noyan could not help but be pleased. The litany was remarkably effective at creating the right frame of mind in the initiates. He looked over at Gideon, and saw both eyebrows raised, the normal flat stare finally conquered by a stunned wide-eyed silence. "Maybe . . . maybe this was not a good idea," croaked Gideon. Not a good idea? Noyan had been irritated for the much of the day, much of every day since becoming a roilmage, but this was the first time he had been angry. This armored bumpkin had come to his school and presumed he could just order him and his students around and then decided they weren't good enough? Not a good idea! "A practical demonstration is in order," Noyan said. "I insist." It took the better part of the morning to transport Gideon, Noyan, and the initiates over to the main continent of Tazeem. 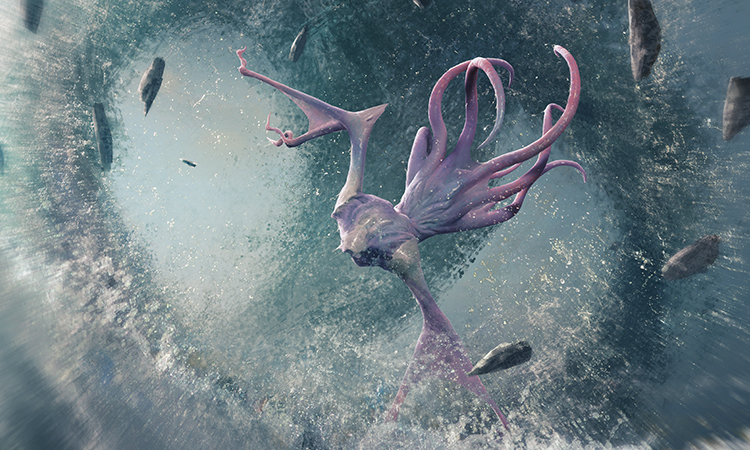 They were many miles outside of Sea Gate, but the Eldrazi density had increased significantly in the last few months. Finding roaming herds of them was not difficult. Noyan wondered for an idle second whether Gideon was perhaps some secret, brilliant tactical mastermind, devising a facade of the idiot warrior, and using Noyan's own pride to manipulate him into devoting the roilmages to his cause. The second passed and Noyan discarded the thought. First, Noyan was perhaps the only mind brilliant enough to conceive of such a plan. Second, Gideon Jura was an idiot. No idiot could be that good at duplicity of such a level. Noyan's plan was simple and elegant. Gideon balked, asking many annoying questions regarding contingencies Noyan assured him would not come into play. Eventually Gideon was reduced to communicating through raising eyebrows. He displayed a remarkable facility at raising both his left and right eyebrows. He was a man of many talents, this Gideon Jura. Gideon had been most concerned about the consequences of attracting Eldrazi, considering their own small numbers. He had suggested several tiny groups but Noyan dismissed each one. They needed a group large enough to provide a suitable stage for performance. 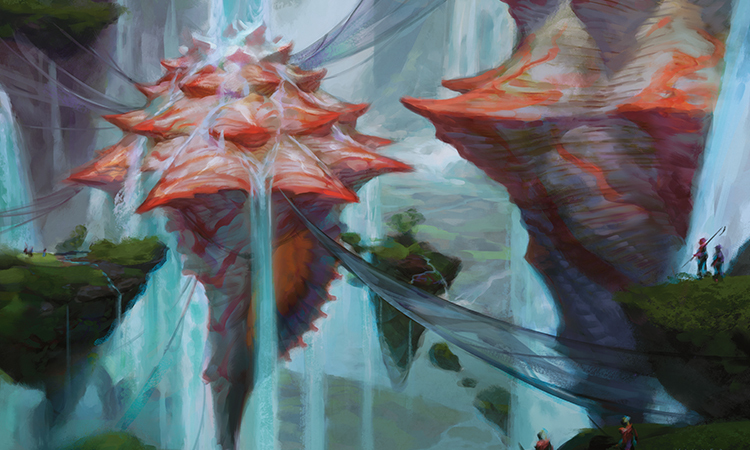 On an already-desiccated plain, they found an isolated group with several hundred of the creatures, scions and drones, and a few larger creatures that Noyan labeled as "direct lineage" to Ulamog itself. The initiates were nervous and excited as they spread in a wide circle on the plain. Though, to be fair, they were nearly always nervous and excited. It wasn't even their first time dealing with Eldrazi . . . that was just a function of life on Zendikar now. But it was going to be the first time they were using their magic in conjunction with each other to fight the Eldrazi. This was to be their first live test. While the initiates yelled at each other and themselves in bizarre rituals of preparation, Gideon Jura was motionless. Smooth, poised, and unsurprisingly, silent. As the first Eldrazi began to gather, glowing, supple metal blades appeared out of some mechanism in Gideon's hand. Noyan rolled his eyes in disbelief. He wanted to slap Gideon, but would probably end up cutting off his own hand. What sane, intelligent person has blades coming out of one's hand? Noyan had thought he would have to generate some form of magical beacon to draw the Eldrazi, but there proved no need. 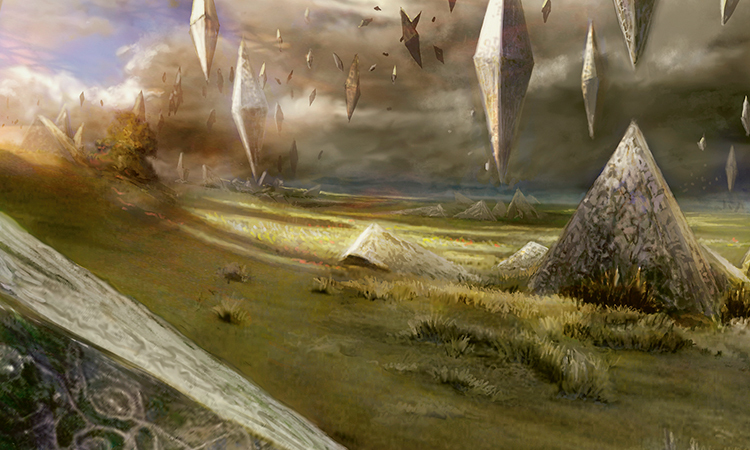 The Eldrazi slowly began swarming in the direction of Gideon and Noyan, ignoring the initiates spread wide. Having never encountered this reaction before on his own, Noyan thought the most reasonable explanation was the Eldrazi found Gideon as obnoxious as he did. Perhaps the Eldrazi were intelligent after all. Gideon stared at Noyan. "At what point does being a roilmage involve using the Roil? There are a lot of Eldrazi out there." Even obnoxious idiots sometimes had a point. Noyan spread his hands out wide, and gave the signal for his initiates to begin their exercise. In class they called it "working the circle." The initiates began their conversations with the Roil, each in their own way. Some spoke to the earth and some to the air. While there was no large body of water, some roilmages spoke to the ever-present water inside the earth. It was time for Noyan to begin his own magic. Feel the irritation. It is the mosquito in the night, the itch between your shoulder-blades, the raw pain that never heals. It is the sneeze that will not come, the morsel of food stuck in your teeth, the crying of the child not yours. Feel it. Noyan was barely aware of the outside world, only having glimpses at the edge of consciousness as Gideon whirled and twirled snapping glowing blades in a kaleidoscopic display of mastery that even if Noyan was able to pay full attention, he was sure he'd find pretentious and boring. The Eldrazi were pressing, and Gideon kept them at bay. Good boy, he tried to say, but the demands of the Roil pressed upon him. Every wrong interaction of the day, every missed note and awkward move, every single word emitted from the dark hole of Gideon's mouth, every mote of alienation and bitterness, Noyan Dar swept up and gathered within himself. 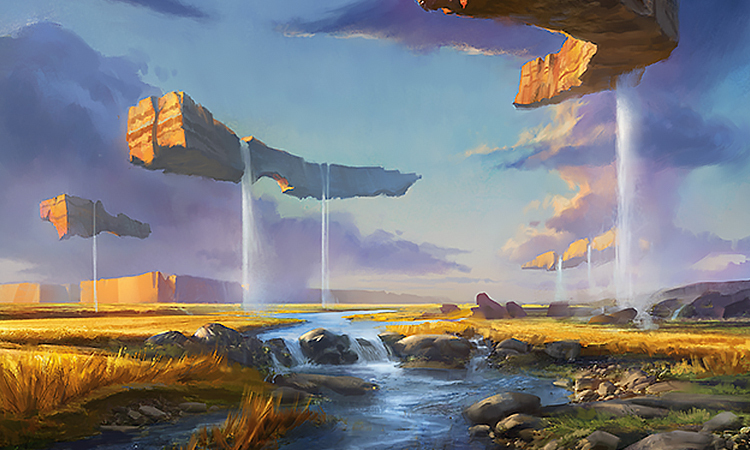 This is what the earth felt, this is what Zendikar felt, when the awful alien touch of the Eldrazi fell upon it. In the wider circle, the initiates had achieved connections with parts of the Roil. The earth between the initiates and Noyan rumbled and shook, the air gusted and moaned, and the initiates moved earth, air, and water in a semi-circular pattern, back and forth. Swoosh, swoosh, the ground shifted and heaved as it tried to rotate along the wide circle. The initiates began aligning their movements and timing, and the large circle of earth surrounding Gideon and Noyan began to rotate in one direction and then the other. 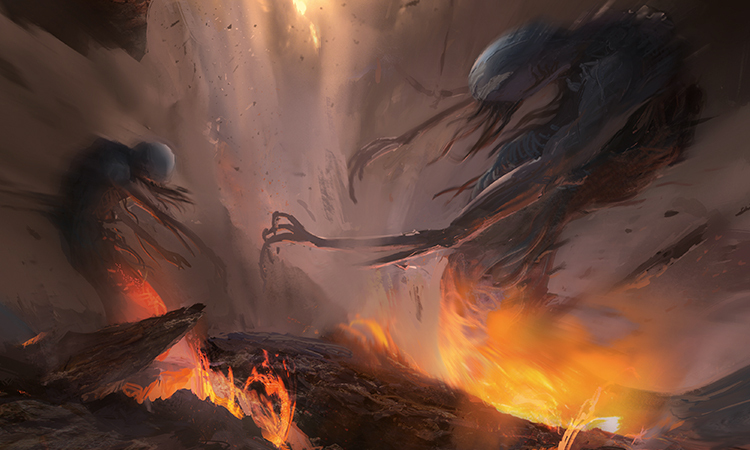 The Eldrazi were driven into a frenzy by the earth shifting and rumbling beneath them. No longer lethargic, they buzzed in intensity as they hurled themselves at Gideon and Noyan. Gideon's skin glowed and golden sparks from an invisible shield of energy shimmered constantly as he became a never-ending blur of savage cuts and thrusts. An Eldrazi tentacle lashed out at Noyan's face, and somehow Gideon was there first, knocking it away and decapitating the Eldrazi in one near-impossible motion. The larger Eldrazi were almost on top of them, and Gideon's breath labored. "If you're going to do anything to actually kill Eldrazi, I suggest you do it soon. I can't keep you alive forever." The Roil was close. So close. It wanted to lash out, but Noyan wouldn't let it, not yet. The irritation within Noyan, within the earth, grew. The initiates had melded their magics into one autonomous beat, finally finding the rhythm that had eluded them all morning. Swoosh, swoosh as rock unmoored and wind loosened. The earth wanted to destroy them all, eliminate every blighted touch from the hand of decay; the Roil surged and bucked, desperate to find relief. An Eldrazi twice as tall as Gideon brought a limb down thicker than a tree trunk on top of them. Gideon raised his arm and the massive limb crashed into his energy shield, igniting a flurry of golden sparks. But Gideon sunk down to the ground on one knee, and the Eldrazi giant brought his arm around for another blow. "You are invulnerable, right?" Noyan shouted. Gideon nodded. Noyan cast his spell. All the earth between Noyan and the circle of initiates disintegrated underneath in a circling vortex of wind, magma, and rock. Where once were hundreds of feet of solid ground, there now was . . . nothing. 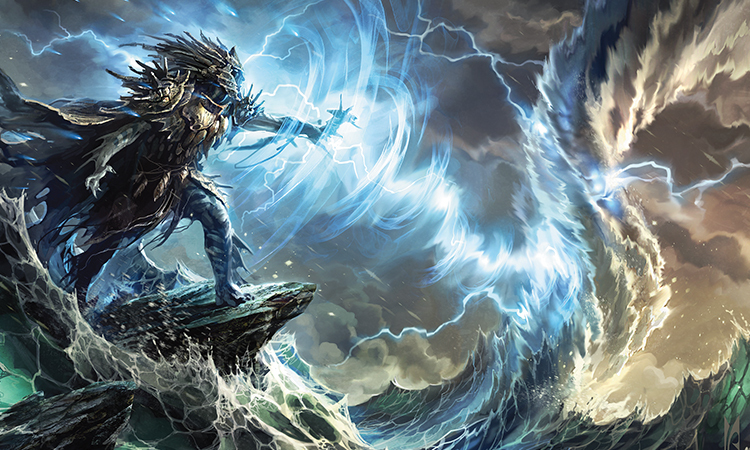 The Eldrazi and Gideon plummeted through a storm of falling debris, and Noyan could see the sparking golden light of Gideon's shield shimmer constantly as Gideon fell. What had been the din of chaotic battle was now replaced by stunning silence. Noyan stood, alone, on a patch of earth barely two feet square. Hundreds of feet in every direction was now chasm, a great void separating himself from his initiates, who looked on in disbelief at what they had wrought. The initiates looked at the chasm, and at each other, and began cheering. As the debris settled far below, they could make out the corpses of the Eldrazi plus a lone figure surrounded by golden glowing sparks as rocks and fire made their final falls. Noyan smiled. It was a fantastic moment. The only thing he regretted was Gideon had not screamed once his entire way down. What did it take to perturb that man? "You have a powerful team, Noyan Dar. We would love to have all of you at Sea Gate with us. We need you." The initiates . . . no, that was not quite fair. The roilmages gathered around them cheered. After Noyan and Gideon had both been rescued, they had all regrouped on a cliff settlement near Coralhelm. Noyan beamed. Finally the man recognized the true worth of the roilmages! It was hard not to feel smug. "I suppose it was a good idea for you to come see us after all." "Yes, it was." Gideon looked at Noyan intently, but there was something in his eyes that made it awkward for Noyan to try and make fun of it. "I am sorry, Noyan, for any doubt. That display was amazing." Gideon smiled, and Noyan stood there, silent and stunned at how proud he felt, just because an idiot warrior had praised him. The roilmages began bringing out food and drink. There was going to be a big party tonight for all of them to celebrate their victory. The Eldrazi would still be there tomorrow. Gideon motioned at the kitesailer who brought him to begin preparations for leaving. "I have to get back to Sea Gate. All of you will come tomorrow?" "Yes, Gideon Jura. We will be there." Noyan wanted to say more, ideally something quippy and sharp, but he didn't have the words. All his quips were strangely gone. Gideon turned back. "One question, though, before I leave. In the story you were telling me, the one about Cosi and Ula, who ended up with the pearl?" Noyan smirked. "Cosi did, of course. That's how most Cosi stories end up, with Cosi convincing Ula to do something that Ula hadn't initially wanted to do, and then Cosi ends up benefiting from it." Noyan loved the Cosi stories. Gideon smiled. "Smart one, that Cosi. Too smart for me, anyway. I'll see you at Sea Gate, Noyan." Gideon turned and strapped himself into the kitesail harness, and the kitesailer and Gideon began their ascent back to Sea Gate. Noyan watched them go, bemused at Gideon's open admission of his limited mental faculties, and pondering the strange easy smile on Gideon's face. It was only later in the evening, after much alcohol and further deliberation on Gideon's last words, that Noyan Dar's elation turned into a very flat stare.